From bitter cold to tropic heat, wool is a natural insulator and regulates your body temperature. ​The tiny pockets within the wool become the same temperature as your body temperature and allow air to breathe. This allows you the perfect night's sleep. Sleep is the time that your body refreshes and rejuvenates itself so having the right bedding is key. Since the average adult spends just 6.5 hrs sleeping at night, the quality of such little sleep time is imperative. Frankenmuth Woolen Mill bedding is great for sufferers of fibromyalgia and arthritis because wool is a supportive bedding that distributes weight evenly. In addition, wool is a natural insulator, it eliminates hot and cold spots that cause restless sleep. Wool is naturally hypo-allergenic, thus it repels dust mites and wicks moisture for a more sound sleep. Wool is a 100% renewable resource. Each year sheep are sheared for their wool as it is a necessary part of ranching. Rest assured, the sheep that grow your wool are still happily grazing California meadows. ​Our commitment to quality and great sleep starts with our wool. We scoured the country to find ranchers who not only treat their sheep humanely but also share in our passion of providing materials and products that are made in the USA. Once the wool arrives at the Mill, it is processed traditionally using our century-old machinery. It's hand washed in bathtubs using 170 degree water and dried for 3 - 5 days depending on the time of year. After the wool is dried it is taken to our carding room where it's combed and processed on one-hundred year old equipment using no chemicals or oils. After the wool is processed it's taken to our finishing area where organic, cotton fabric and wool is stretched over wooden frames and tied in the old European fashion ~ being tied by hand. Tying holds the wool in place and keep the wool secure so the wool doesn't move around inside. After the Wool Filled Comforter is tied, the edges sewn and it's ready for sale. On each step through the Mill there is great attention to detail so that each product we produce is delivered to our high standards. Handwash: Lukewarm water & mild detergent. We accept unused and still in the original packaging bedding for 7 days from receipt of the shipment. Please call 888.497.4534 for shipping to Alaska or Hawaii. Our wool comforters are filled with cozy, pure, Climate Beneficial wool. With this wool, our comforters naturally repel dust mites, mold, mildew, and moisture. Our hand-tied 100% organic muslin comforter is perfect for every season. It's hand-knotted about every nine inches, just enough to hold the wool in place. 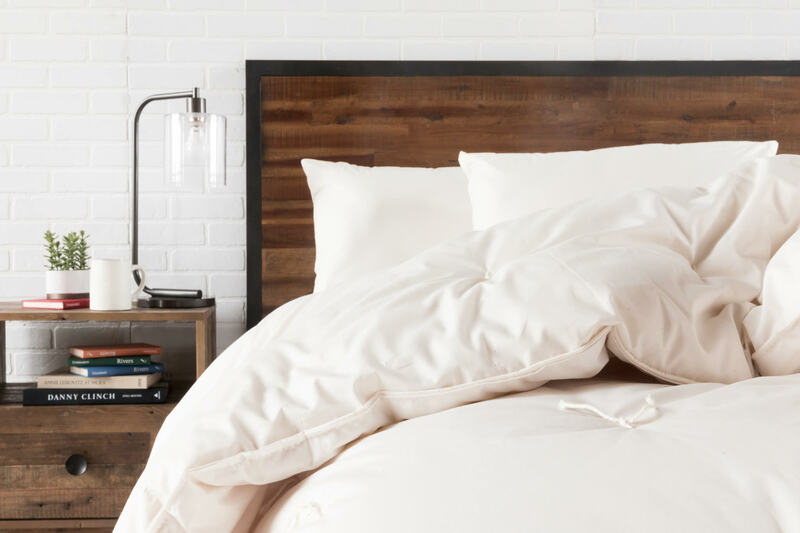 Our wool comforter can be used with a duvet, comforter cover, or alone.